I have a confession to make. I. Love. Chocolate. Like, really love chocolate. Might be one of my top 5 favorite things to eat…and in life in general. I found this recipe for chocolate truffles online and decided that I just had to give them a try. I used a combination of bittersweet and semisweet chocolate bars (both Ghirardelli) for this recipe. You could really use any favorite brand of chocolate for this, but I would stick with the mix of bittersweet and semisweet. 1 cup of heavy cream. Yum! This is the only part of the recipe that requires cooking (heating the cream), and it takes about 10 minutes). Can I just take a minute to gush about the adorable measuring cups and spoons my boyfriend got me for Christmas? How cute are these!?! 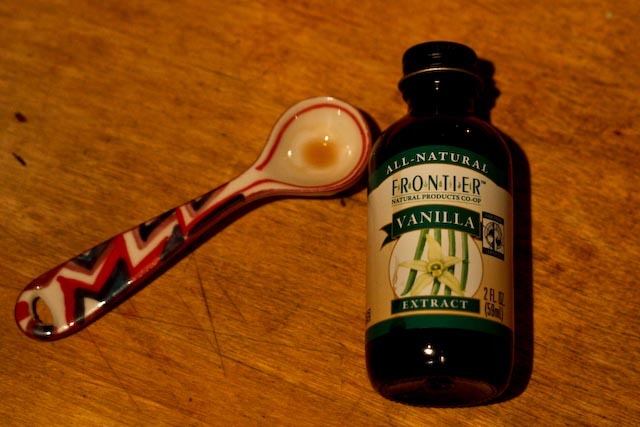 I like to use a good organic vanilla extract. Any high quality vanilla would be great for these truffles. 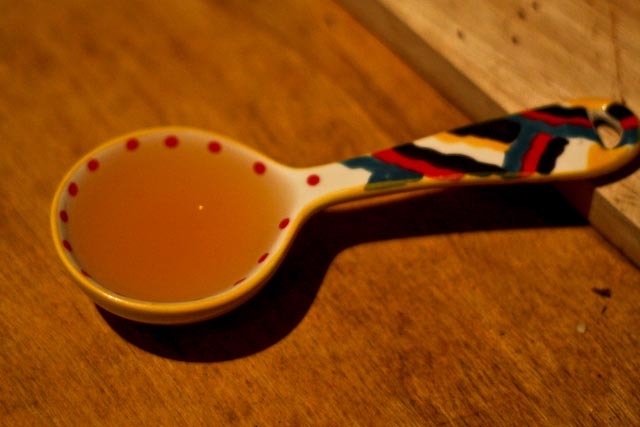 I used Grand Marnier (an orange flavored liqueur). Just a tablespoon adds a hint of citrus and a little extra flavor burst. Everything is combined into one bowl and you let it set up at room temperature for about an hour (it’s that easy!) Perhaps my little kitchen is a bit too warm, but I found it handy to stick the bowl in the freezer for just about 20 minutes before shaping the truffles (if it gets a little too hard in the freezer, just let it sit out at room temp again until malleable). I used a couple of teaspoons to help shape the chocolate into bite-sized balls, and then rolled each ball-of-chocolatey-goodness between my hands to shape it. 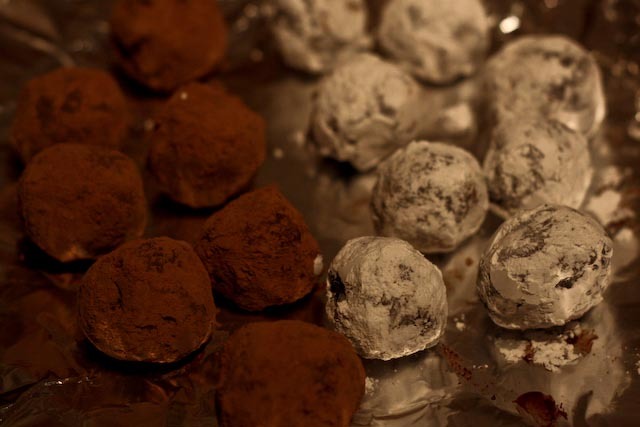 I rolled half the truffles in cocoa powder and the other half in powdered sugar. Don’t they just look sinful?? I actually made these as a gift – and thankfully so, otherwise I probably would have eaten them all. Myself! 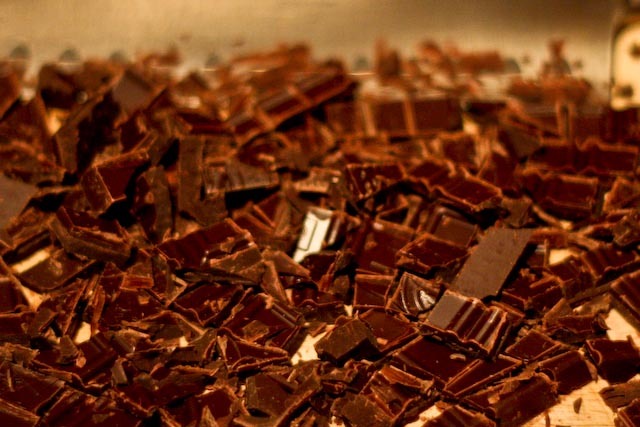 Chop the chocolate finely with a sharp knife and place it in a mixing bowl. 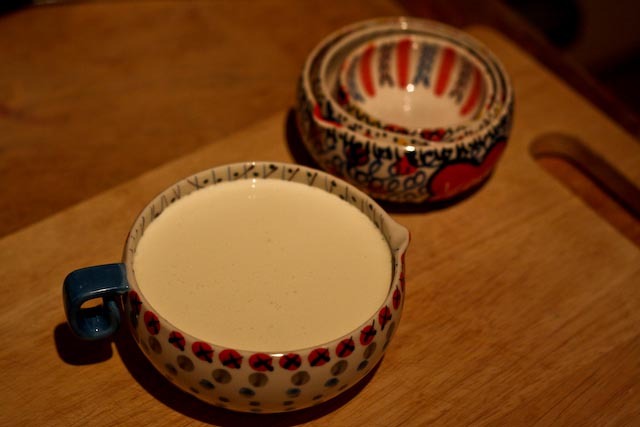 Heat the cream in a small saucepan until it just boils. Turn off the heat and allow the cream to sit for about 20 seconds. 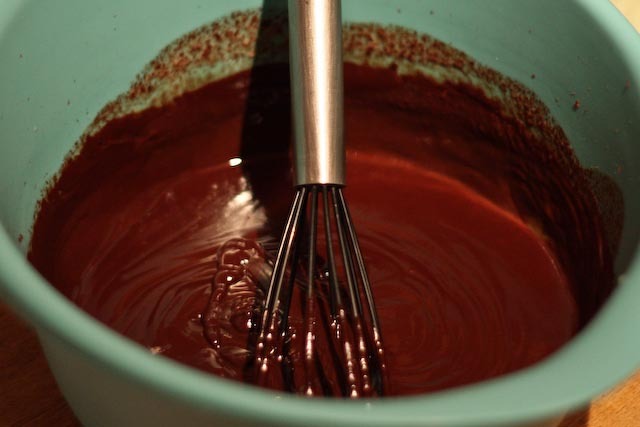 Pour the cream through a fine-meshed sieve into the mixing bowl with the chocolate. 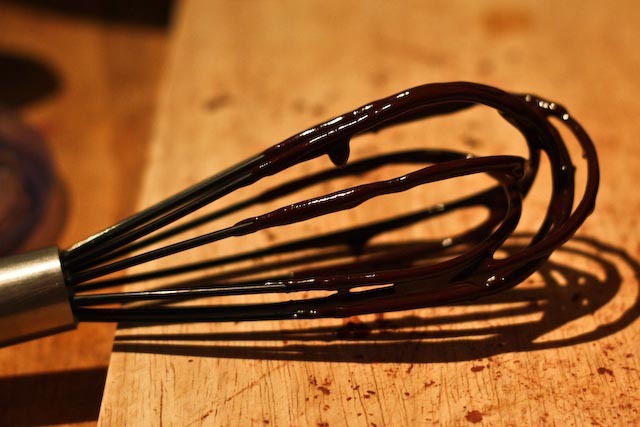 Whisk the cream and chocolate together until the chocolate is completely melted. 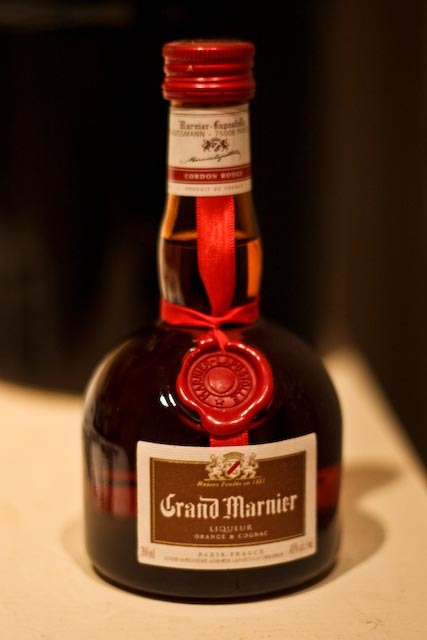 Stir in the Grand Marnier, coffee, and vanilla extract. Set aside at room temperature for 1 hour. 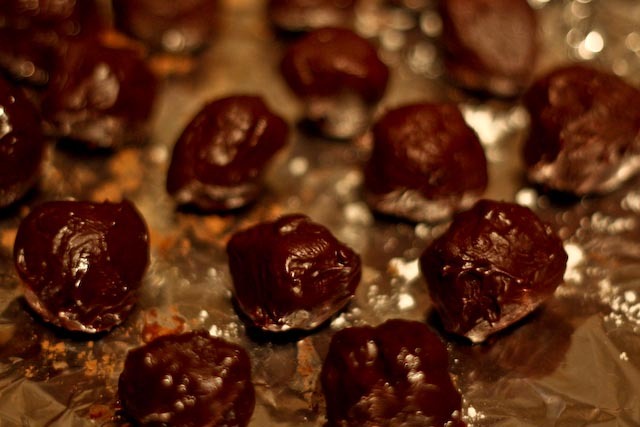 With two teaspoons, form round, bite-sized balls of the chocolate mixture onto a baking sheet lined with parchment paper. Roll each ball of chocolate in your hands to make it round. [If the chocolate is too soft to shape into the truffles, place in the freezer for about 20 minutes or until set enough to work with.] 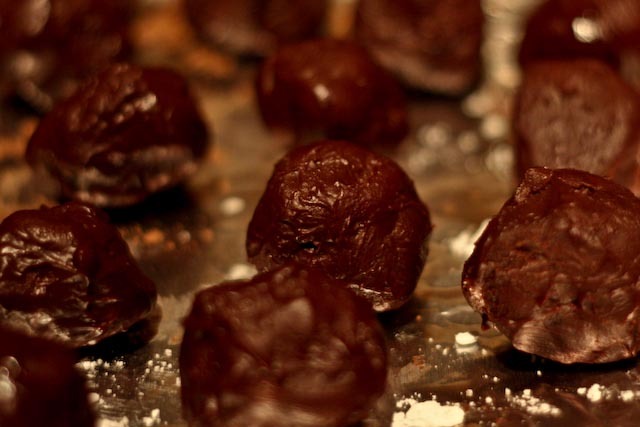 Roll the truffles in confectioners’ sugar or cocoa powder. Truffles will keep refrigerated for several weeks, but should be served at room temperature. Nutrition Information: Don’t think about it and enjoy. Happy New Year! 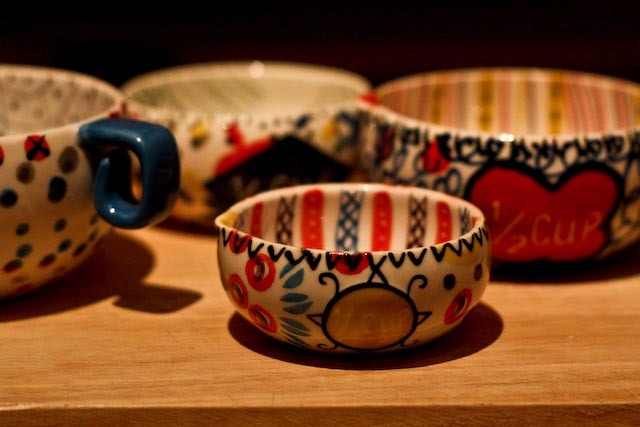 These are gorgeous, and yes, I love the measuring cups and spoons – I actually looked longer at those photos than the chocolate!